The Cybernetic players use special kick shots and built-in arm phasers to destroy other players. Make sure your power meter is FULL when exercising these brutal tactics. Both stadiums, which are magnetically enclosed, enable you to kick or pass... off the wall! There are no fouls in this league, so watch your back or you'll get pulverized by the opposing team! You'll find here the most advanced sport in the world of soccer... SOCCER BRAWL! 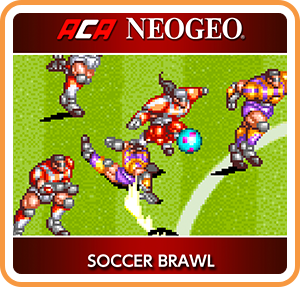 Where can I buy ACA NEOGEO SOCCER BRAWL physical/digital?